The Rubber Cafe Design Team Blog: Live for Today! The sentiments on this month's Creative Cafe stamps are certainly going to get a work out in my home. I love the deep meanings and the different ways they all can be used. 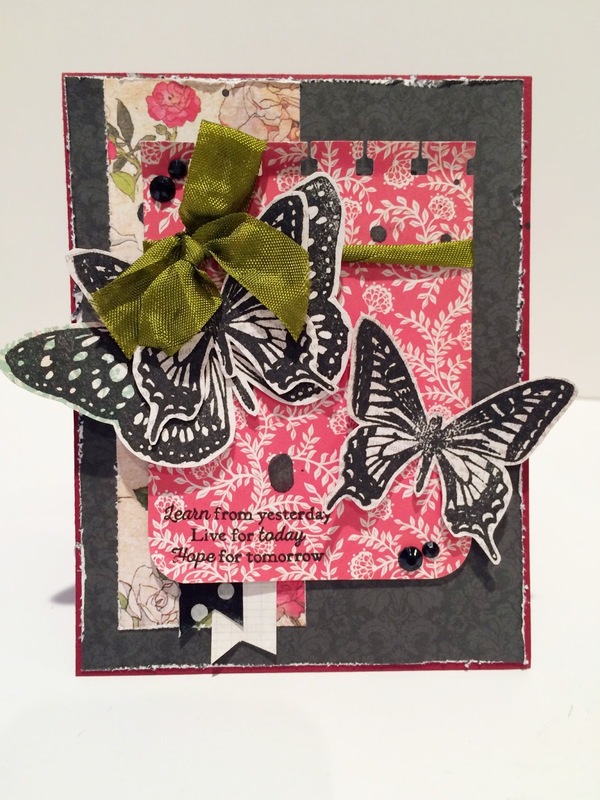 Mary-Ann here to share another card with you today, hoping that I inspire you to create. I started with an A2 base of the deep red paper included in your kit. With a pair of scissors or a distressing tool, I roughed up the edges of a 4 x 5 1/4 piece of black patterned paper. I added a 2x4 1/2 strip of floral paper to the left of the card with my Scrap Happy Glue. A 3x4 block of red floral with the top part punched. You can use any border punch you have on hand. I twirled my ribbon, to create more of a rope and tied a bow to the left. I then backed it with Kool Tak foam, where the ribbon was NOT. 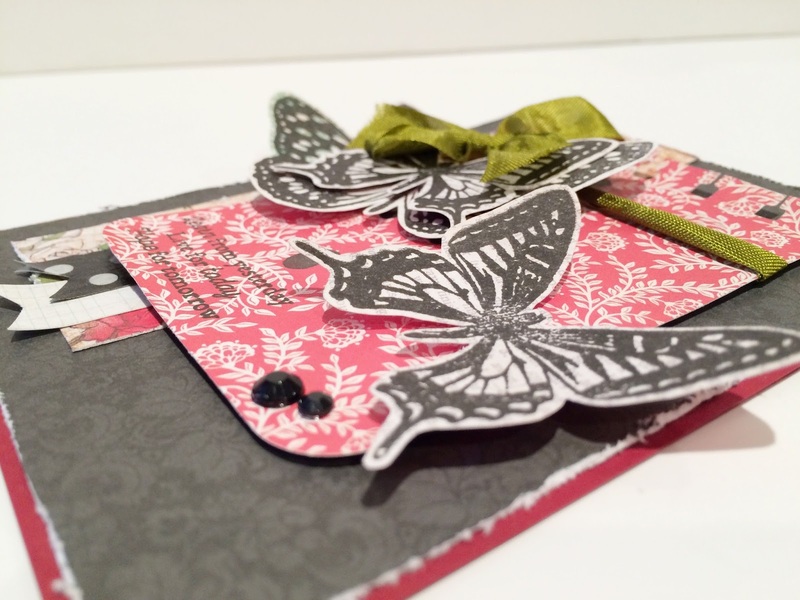 I then stamped a large butterfly and two small butterflies with Momento Tuxedo Black on scrap white paper. Now I am thinking that embossing them would have been even better! I added them like so, slightly lifting the outer wings for dimension. I then added small paper banners under the stamping to the bottom left of the red block. For the black polka dot one, I took a piece of washi, included in your kit, and folded it onto itself, then cut it into a banner like you see. Add gems and paint splatters with Dylusions Black ink and voila! You can create several cards with different pattern papers. Thank you so much for stopping by today. See you next week!